Chen, Q., Zheng, X., Zhou, L., and Kang, M. (2019). "Chemical modification of starch microcrystals and their application as an adsorbent for metals in aqueous solutions," BioRes. 14(1), 302-312. Starch microcrystals have the advantages of native starch grains but with higher specific surface area and numerous active sites. In this study, tapioca starch microcrystals were made by sulfuric acid hydrolysis and then chemically modified with succinic anhydride in an aqueous alkaline medium. The succinylated starch microcrystals were characterized by Fourier transform infrared spectroscopy (FTIR) and scanning electron microscopy (SEM). The adsorption properties of the succinylated starch microcrystals in aqueous solutions were studied at different time periods (1 to 60 min), pH (2 to 7), and metals concentration (100 to 2000 mg/L) for different divalent metal ions such as Cu(II), Zn(II), Cd(II), and Pb(II). The results showed that the starch microcrystals were successfully succinylated, and their adsorption equilibrium for divalent metal ions was reached within 1 min. The adsorption capacity in high metal concentration was 147.7 mg/g for Cu(II), 143.2 mg/g for Zn(II), 216.4 mg/g for Cd(II), and 216.0 mg/g for Pb(II)). The metal-adsorption of succinylated starch microcrystals followed the Freundlich isotherm. Anthropogenic activities have caused a great deal of environmental pollution, and water contaminated by toxic heavy metals is one of the most pressing problems. With the rapid development of industries such as metal plating facilities, mining operations, fertilizer industries, tanneries, batteries, paper industries, pesticides, etc., increasing amounts of heavy metal wastewaters are discharged into the environment, especially in developing countries (Fu and Wang 2011). Heavy metals are not biodegradable and accumulate in living organisms, which leads to serious illness. For example, exposure to excessive levels of lead can damage the central nervous system, kidneys, liver, reproductive system, and basic cellular processes (Naseem and Tahir 2001). In most countries, industries are held liable for reducing toxic metal concentration to less than a specific value. Conventional approaches to remove heavy metal ions include chemical precipitation, adsorption, membrane filtration, flotation, coagulation, flocculation, and electrochemical treatment (Huisman et al. 2006; Jusoh et al. 2007; Heidmann and Calmano 2008; Muthukrishnan and Guha 2008; Samrani et al. 2008; Yuan et al. 2008; Chang et al. 2009). Synthetic resins have been widely applied for chelating and recycling metals but are mostly composed of petroleum-based synthetic polymers (Alyüz and Veli 2009). Biosorption of heavy metals from aqueous solutions is a relatively new process that has proven very promising for the removal of heavy metal from wastewater. Starch is a biopolymer of plant origin that is cheap, biodegradable, renewable, and abundant. Native starch has no chelating capacity because its hydroxyl groups cannot interact with metal ions. Some chemical modification is needed to change the properties of starch (Haroon et al. 2016). For example, starch modified with succinic anhydride effectively removes Cu(II), Zn(II), Cd(II), and Pb(II) from wastewater (Kweon et al. 2001). Nano- and micro-bio-based materials have also shown high efficiency in chelating metal after the succinylation reaction (Gurgel et al. 2008; Hokkanen et al. 2013). Starch microcrystals (SMCs) are crystalline platelets formed from the breakdown of starch granules by acid hydrolysis (Le et al. 2010). As nano-scale composites, SMCs have the advantages of native starch, but in addition they possess high specific surface area and innumerable exposed reactive sites (Angellier et al. 2004; Chen et al. 2008; Yu et al. 2010). Recently, SMCs have been modified for use in drug delivery (Xiao et al. 2016), biocomposite films (Mukurubira et al. 2017), and as hydrophobic materials (Zhou et al. 2016). SMCs can be modified with substituents to be used as adsorbents for aromatic organic pollutant (Alila et al. 2011). Besides, starch nanoparticles can be used as an adsorbent after being oxidized (Liu et al. 2017), but starch nanoparticles were prepared by recrystallization, and were “particles” rather than “crystals”. Thus, differences still exist between these two nano-starch particles (Haaj et al. 2016). However, there is no research to date about the application of SMCs or modified SMCs as adsorbents for metal ions. In this work, SMCs and the succinylated SMCs were prepared and characterized with Fourier transform infrared spectroscopy (FTIR) and scanning electron microscopy (SEM). The evaluation of succinylated SMCs to adsorb Cu(II), Zn(II), Cd(II), and Pb(II) ions in aqueous solutions was studied for guiding its application in wastewater treatment. Tapioca starch was supplied by Fuyang Biotechnology Co., Ltd. (Shandong, China). Succinic anhydride, CuSO4·5H2O, ZnSO4·7H2O, Cd(NO3)2, Pb(NO3)2, and H2SO4 were all of analytical grade and were purchased from Sinopharm Chemical Reagent Co., Ltd (Shanghai, China) for use without further purification. In this study, 100 g of tapioca starch was acid hydrolyzed in 400 g of aqueous H2SO4 (3.16 mol/L) at 40 °C for six days with continuous stirring, followed by successive centrifugations and a wash with deionized water to remove all free acid (Angellier et al. 2004). The tapioca SMCs slurry was stored in the refrigerator for further modification. SMCs (10 g dry weight) were dispersed by an ultrasonic wave (VOSHIN-501D, Voshin Insturments Manufacture Co.,Ltd, Wuxi, China) at 150 w for 15 min to ensure uniform suspension, and then they were stirred magnetically so that pH could be correctly monitored by a pH-meter. The pH was adjusted to 9.0 using 1 mol/L NaOH, and 5 g of succinic anhydride was slowly added to the solution maintaining a pH range of 8.5 to 9.0. After 2 h of reaction at the temperature of 25 °C, the pH of the solution was adjusted to 6.0 using 1 M H2SO4 (Kweon et al. 2001). The mixture was centrifuged and washed three times with an ethanol solution (50%), and finally the slurry of succinylated SMCs was stored in the bottle. The synthesis route of the succinylated SMCs is shown in Fig.1. where A, N, and W represent the titration volume (mL) of the NaOH solution, molar concentration of the NaOH solution, and dry weight (g) of the succinylated SMCs, respectively. The DS of succinylated SMCs prepared for adsorption was 0.091. FTIR spectra of native starch, SMCs, and the succinylated SMC were recorded by a Bruker Vertex 70 v vacuum spectrometer (Karlsruhe, Germany) in reflection mode. The range was from 4000 cm-1 to 400 cm-1, and the resolution was 2 cm-1. The surface morphology of tapioca native starch, SMCs, and succinylated SMCs were analyzed using a Jeol scanning electron microscope (JSM-6490LV, Kyoto, Japan). The images were obtained using an accelerating voltage of 20 kV. where V is the volume of the metals solution (L), C0 and Ce are the initial and final concentrations of the metals in the solution (mg/L), respectively, and W is the weight of the adsorbent (g). where qe is the amount of the solute adsorbed at the equilibrium per unit weight of the adsorbent (mg/g), Ce is the equilibrium concentration of the solute in the bulk solution (mg/L), and Qmax is the maximum adsorption capacity (mg/g) per unit mass of the substrate. KL is the Langmuir equilibrium constant related to the energy of adsorption. KF and n are constants incorporating all factors affecting the adsorption process, such as adsorption capacity and intensity, respectively. Figure 2 shows the FTIR spectra of tapioca native starch, starch microcrystals, and the succinylated starch microcrystals. A typical broad hydroxyl peak at 3430 cm-1 was found in all three starch samples. The strong adsorption at 2929 cm-1, 1645 cm-1, and 1384 cm-1 was due to the asymmetric stretching of -CH2, H-O-H banding, and symmetric twisting of -CH3. A new peak at 1736 cm-1 was observed in the spectrum of the modified SMCs, which was located at the asymmetric and symmetric stretching of ester C–O, indicating that the esterification reaction took place between the SMCs and succinic anhydride during the synthesis process. Furthermore, a new peak at 1560 cm-1, corresponding to the asymmetric stretching of carboxylic group on the surface was observed after the modification of the SMCs (Kweon et al. 2001; Awokoya and Moronkola 2012). 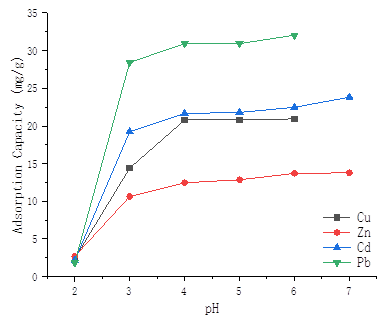 A comparison of the three starch samples with the FTIR spectral proved that the tapioca starch microcrystals were successfully succinylated and that the succinylated SMCs were prepared successfully in this study. Scanning electron micrographs of the tapioca native starch, starch microcrystals, and succinylated starch microcrystals are shown in Fig. 3. Most native starch granules were potato-like, round, and irregular with withered smooth or wrinkled skin, and the average particle size of the native starch was around 10 μm. After hydrolysis with sulfuric acid for the native starch, a small amount of plate-like SMCs were observed, but most were shaped irregularly, and the average particle size reached to micro-scale. Since there were innumerable hydroxyl groups on the surface of the SMCs, this rendered a tendency to aggregation, especially in dry conditions. When modified with succinic anhydride, the SMCs became more fragmentary, dispersed, and not as smooth as before. The surface of the modified SMCs appeared to be rough and irregular, covered with many embossments. The adsorption equilibrium time experiments were carried out at different contact times from 1 to 60 min when the initial concentrations of metal ions were 100 mg/L (Fig. 4). During short times, metal ions in the solution were quickly bound with the absorbent due to the presence of numerous active sites on the adsorbent surface. 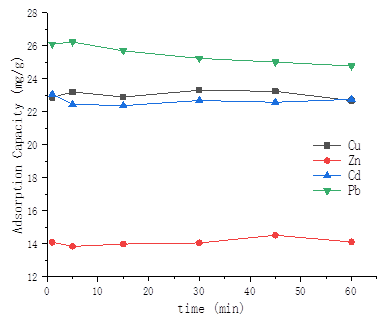 Within 60 min the adsorption efficiency remained rather similar, and did not increase or decrease dramatically. Because the adsorption equilibrium was reached within 1 min, reactions for much longer time-frames were not needed. Therefore, 5 min was chosen as the equilibrium time for pH and concentration-dependent experiments. The removal of metal ions from aqueous solutions by adsorption depends on the solution pH. To maximize the efficiency of the adsorbent, determining the optimum pH is necessary. The solution pH was varied from 2.0 to 6.0 for Cu(II) and Pb(II) and from 2.0 to 7.0 for Zn(II) and Cd. The initial concentrations of metal ions was 100 mg/L; no precipitation of metals was observed in the experiments. As presented in Fig. 5, the modified SMCs became more reactive with the metal ions as the pH of the metal solution was increased. When the pH value was low (pH 2.0), the active sites on the absorbent surface were highly protonated by H+, so that the adsorption was negligible (less than 3 mg/g). By increasing the pH to 4.0, the concentration of the protons decreased and the adsorbent surface charge became negative when electrostatic attraction increased between the metal ions and the adsorbent (Huang and Ostovic 1978). But the adsorption capacity did not increase much more when the pH was above 4.0. 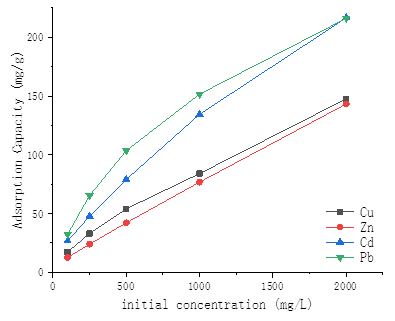 The Cu(II) and Pb(II) adsorption reached its maximum efficiency at pH 6.0, Cd(II) and Zn(II) reached its maximum efficiency at pH 7.0. As shown in Fig. 6, when the initial concentrations of metals ions were varied from 100 mg/L to 2000 mg/L, the adsorbed amount of metal ions by the modified SMCs was significantly increased, and it even showed linear growth for Cu(II) and Zn(II). Although the growth rate for Pb(II) and Cd(II) decreased slightly, its adsorption efficiency was still enhanced at a higher concentration. At the same experimental condition (metal ion concentration), the adsorption capacity of the modified SMCs did not show smooth growth trends as did the modified starch (Kweon et al. 2001). Therefore, this new-type of adsorbent has its advantages in cases of high concentration of metal ions removal. This is due to two reasons: increasing initial concentration could increase the contact of surface solid-liquid, resulting in the higher collision between metal ions and the SMCs adsorbent material (Awokoya and Moronkola 2012); and the modified SMCs had plenty of adsorption sites for more metals. When the initial ion concentration was increased from 100 mg/L to 2000 mg/L, the adsorption capacity of Cu(II), Zn(II), Cd(II), and Pb(II) increased from 17.3 mg/g to 147.7 mg/g, 12.7 mg/g to 143.2 mg/g, 26.8 mg/g to 216.4 mg/g, and 32.4 mg/g to 216.0 mg/g, respectively. The adsorption of divalent metal capacity of the succinylated starch was studied (Kweon et al. 2001). Much has been written about modified starch as an adsorbent; the same reaction process is likely to apply to SMCs. However, the great differences of properties between starch and SMCs could lead to different reaction products. The adsorption process is usually studied through graphs known as adsorption isotherms. These plots show the amount of adsorbate adsorbed on the surface of the adsorbent and the pressure at a constant temperature. The Langmuir model was developed for well-defined localized adsorption sites having the same adsorption energy, independent of surface coverage and without interaction between adsorbed molecules. The Freundlich isotherm is an empirical expression and is generally appropriate for adsorption processes where non-uniformity of the adsorbent surface is expected. The applicability of the isotherm equations was compared on the basis of the coefficient of determination, R2. The adsorption equilibrium constants KL and KF, as well as the maximum adsorption capacity Qmax for the Langmuir model of the succinylated SMCs, are summarized in Table 1, and the Freundlich constants of the adsorption isotherms are summarized in Table 2. Additionally, KF and n were calculated from the intercepts and slopes of the Freundlich plots. The value of 1/n ranging between 0 and 1 is a measure of adsorption intensity or surface heterogeneity. The value of 1/n becomes more heterogeneous as its value approaches zero. 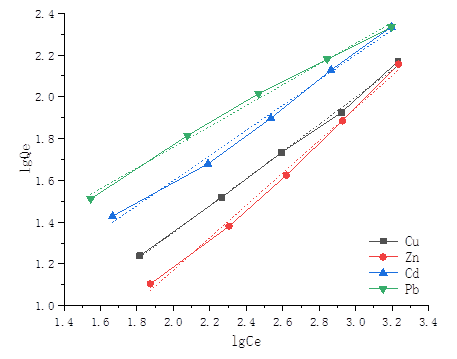 Compared with the coefficient of determination R2, for the Cu(II), Zn(II), and Cd(II), the R2 of the Langmuir model was less than 0.9 and for the Pb(II) the R2 was 0.9681. However, for the Cu(II), Zn(II), Cd(II), and Pb(II), the R2 values of the Freundlich model were all more than 0.99. So, the equilibrium isotherms of Cu(II), Zn(II), Cd(II), and Pb(II) were found to be best fitted by the Freundlich isotherms model. The Freundlich plots for the metal adsorption of Cu(II), Zn(II), Cd(II), and Pb(II) by the succinylated SMCs are shown in Fig. 7. The tapioca starch microcrystals were produced by sulfuric acid hydrolysis, and the succinylated SMCs was prepared in an alkaline aqueous solution. 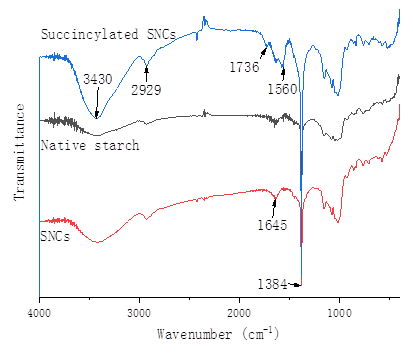 The FTIR spectra showed a new peak at 1736 cm-1 for the modified SMC, which indicated that the esterification reaction between starch and succinic anhydride occurred during the synthesis process. SEM images showed that the succinylated SMCs became more fragmentary, dispersed, and rough. Succinylated SMCs are a rather capable adsorbent for Cu(II), Zn(II), Cd(II), and Pb(II). The adsorption property of the modified SMCs was similar to the modified starch; they both were dependent on pH and initial concentration. The succinylated SMCs adsorbent was more reactive with metal ions because its adsorption equilibrium was reached in a short time and were efficient in dealing with high metal concentration (147.7 mg/g for Cu(II), 143.2 mg/g for Zn(II), 216.4 mg/g for Cd(II), and 216.0 mg/g for Pb(II)).The equilibrium isotherms of Cu(II), Zn(II), Cd(II), and Pb(II) were best fitted by the Freundlich isotherms model. This work was financially supported by the National Natural Science Foundation of China (No. 31500495) and State Key Laboratory of Pulp and Paper Engineering of China (No. 201825). Awokoya, K. N., and Moronkola, B. A. (2012). “Preparation and characterization of succinylated starch as adsorbent for the removal of Pb (II) ions from aqueous media,” Int. J. Eng. Sci. 1(11), 18-24. 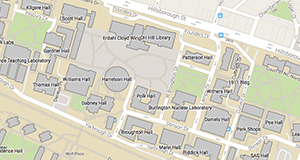 Haaj, S. B., Thielemans, W., Magnin, A., and Boufi, S. (2016). “Starch microcrystals and starch nanoparticles from waxy maize as nanoreinforcement: A comparative study,” Carbohydr Polym. 143, 310-317. DOI: 10.1016/j.carbpol.2016.01.061. Huang, C. P., and Ostovic, F. B. (1978). “Removal of cadmium (II) by activated carbon adsorption,” J. Env. Eng. Div.-Asce. 104(5), 863-878. Liu, Q., Li, F., Lu, H., and M, Li. (2017). “Enhanced dispersion stability and heavy metal ion adsorption capability of oxidized starch nanoparticles,” Food Chemistry 242, 256-263. DOI: 10.1016/j.foodchem.2017.09.071. Mukurubira, A. R., Mellem, J. M., Amonsou, E. O. (2017). “Effects of amadumbe starch microcrystals on the physicochemical properties of starch biocomposite films,” Carbohydr Polym, 165, 142-148. DOI: 10.1016/j.carbpol.2017.02.041. Rutenberg, M. W., and Solarek, D. (1984). “Starch derivatives: Production and uses,” in: Starch: Chemistry and Technology, R. L. Whistler, J. N. Bemiller, and E. F. Paschall (eds. ), Academic Press, San Diego, CA, pp. 311-388. Samrani, A. E., Lartiges, B. S., and Villiéras, F. (2008). “Chemical coagulation of combined sewer overflow: Heavy metal removal and treatment optimization,” Water Res. 42(4-5), 951-960. DOI: 10.1016/j.watres.2007.09.009. Xiao, H., Yang, T., Lin, Q., Liu G. Q., and Zhang L. (2016). “Acetylated starch microcrystals: Preparation and antitumor drug delivery study,” Int. J. Biol. Macromol. 89, 456-464. DOI: 10.1016/j.ijbiomac.2016.04.037. Yu, J., Ai, F., Dufresne, A., and Huang, J. (2010). “Structure and mechanical properties of poly(lactic acid) filled with (starch nanocrystal)-graft-poly(ε-caprolactone),” Macromol. Mater. Eng. 293(9), 763-770. DOI: 10.1002/mame.200800134. Zhou, J., Tong, J., Su, X., and Ren, L. (2016). “Hydrophobic starch microcrystals preparations through crosslinking modification using citric acid,” Int. J. Biol. Macromol. 91, 1186-1193. DOI: 10.1016/j.ijbiomac.2016.06.082. Article submitted: July 29, 2018; Peer review completed: October 28, 2018; Revised version received: October 29, 2018; Accepted: November 1, 2018; Published: November 19, 2018.